If you’re a regular reader of this blog then you might know that I’m a big fan of David Lawson (AKA Sawlon) and his brilliant solo ukulele arrangements. I’m really pleased to say that David has very kindly agreed to let me post his fantastic solo ukulele arrangement tab for The Scientist by Coldplay. I was noodling around on the ukulele just the other day and I came up with a little fingerpicked tune that sounded ok. Rather than let it go to waste and out of my mind (like I usually do) I figured I would tab the tune out and make it available for anyone that is interested. This makes it my first original that I’ve tabbed out for the site (so please be gentle with me). 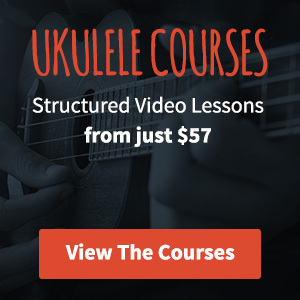 Learn how to play the YouTube smash Can’t Help Falling in Love by Twenty One Pilots on ukulele in this easy to follow lesson with strumming pattern and chord boxes to help you learn. If you’ve spent any time searching for ukulele videos on YouTube then you’ve likely seen at least one video by Dodie Clark. In a pretty big leap from my usual alt-rock stuff today I thought we’d take a look at one of her original songs. I’m not even sure how I ended up listening to Kraftwerk this morning but it doesn’t really matter, I ended up playing around with it on the ukulele and it kind of works ok (if you’re willing to let go a bit).